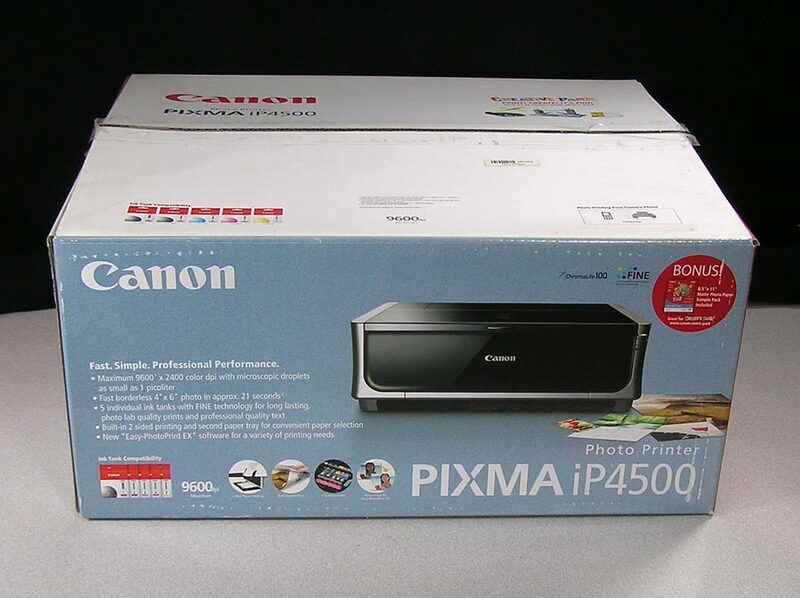 This small Pixma iP1600 photo printer boasts 4800 x 1200 dpi, Chromalife 100 technology, FINE cartridge for photo quality. Comes in original box, and it needs ink. As you can see above, the black cartridge is on it’s last legs. Bargain Priced, so sold as-is. Mac System requirements: OS 10.2 to 10.6, 128MB RAM, 350MB hard drive space. Windows 98 with a 486 Processor and above, 16MB RAM, 370MB hard drive space. It goes to at least Windows XP, please do your own research. No manual, CD, or USB cable included. Drivers are available at Canon. Fast. Simple. Professional Performance. 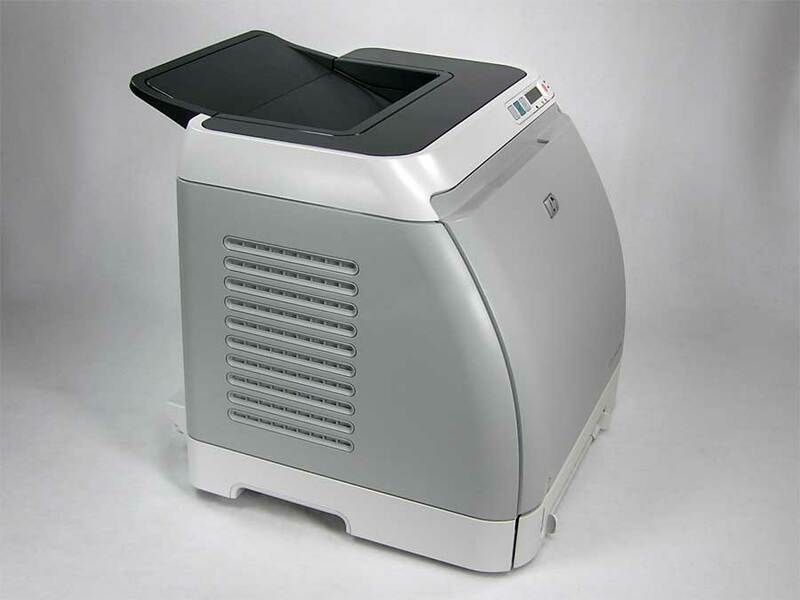 9600 x 2400 color dpi, Chromalife 100, 5 individual ink tanks with FINE technology for long lasting photo lab quality and professional quality text. Built in 2-sided printing and a second paper tray. PictBridge for printing from your phone. Printer looks great! 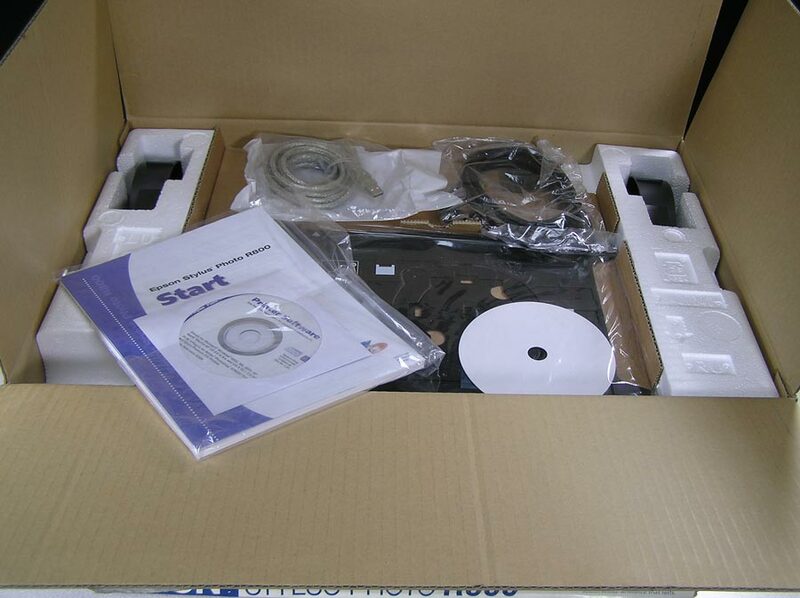 Comes with the original box, manuals, CD, paper tray and cover, power cable, and 8 new sealed cartridges. 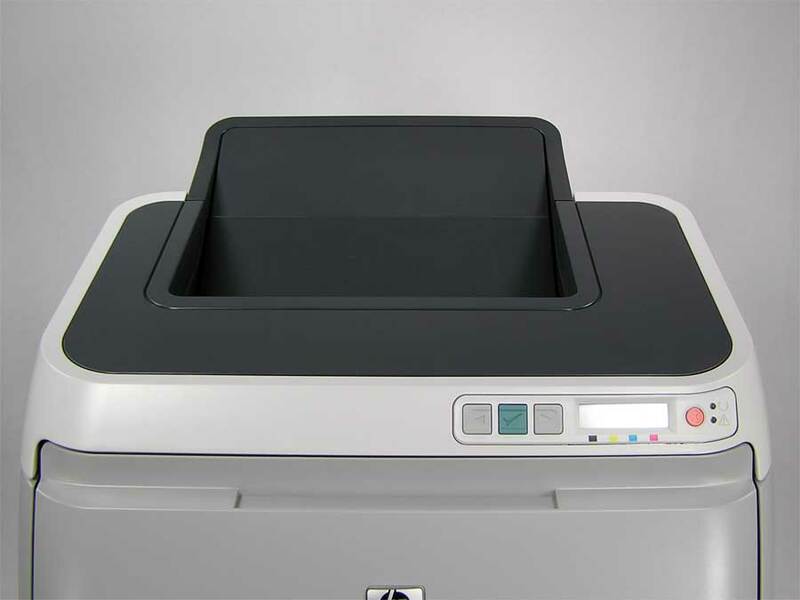 Unfortunately, it needs the large black ink tank – PGI-5BK and won’t print without it. This comes from a friend who insists it go to a good home rather than recycling and guarantees it works great. Bargain priced, sold as-is. Windows: Windows 2000 Professional and up, Pentium II 300MHz, 128MB RAM, 400MB hard drive space. It goes to at least Vista, but please do your own research. Latest drivers can be found at Canon.com. 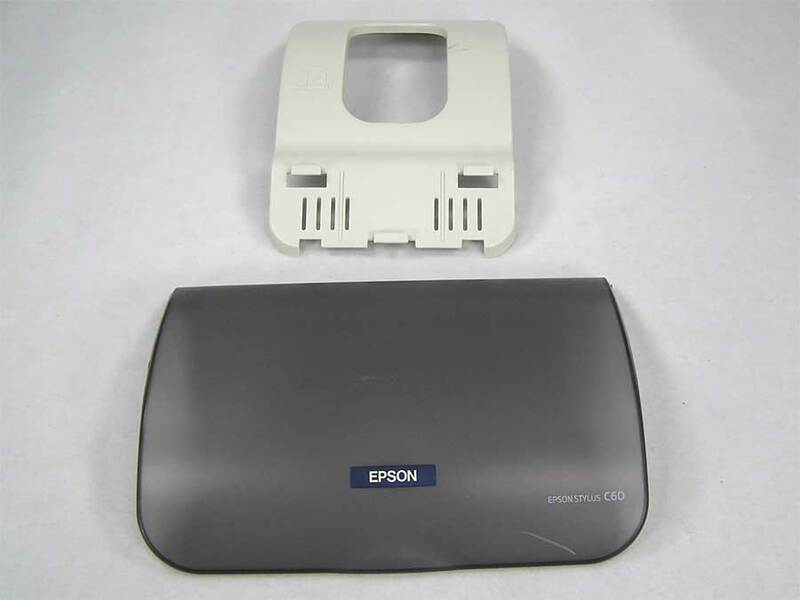 Top cover and rear paper support / input tray for Epson Stylus C60 printer. Used, but in great condition. 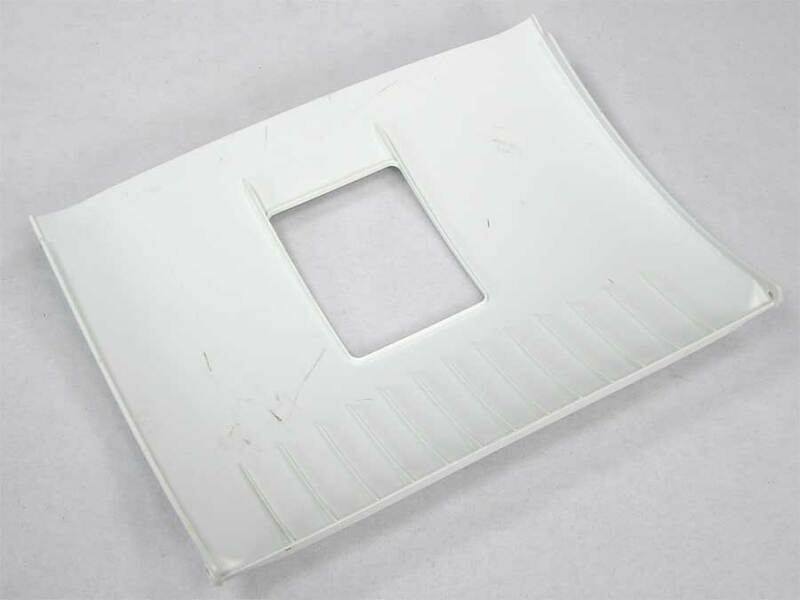 Replace that lost or broken tray. 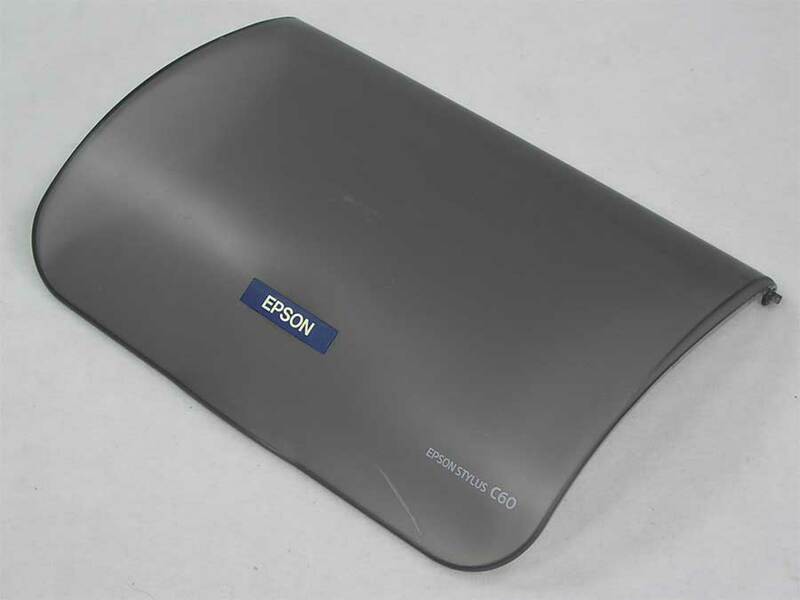 Rear / top paper support / paper input tray for Epson Stylus C80. Great condition. More than photo printing for less than you’d expect. With so many exciting features, the Epson Stylus Photo R200 makes it easy to print frame-ready photos, CDs and more. 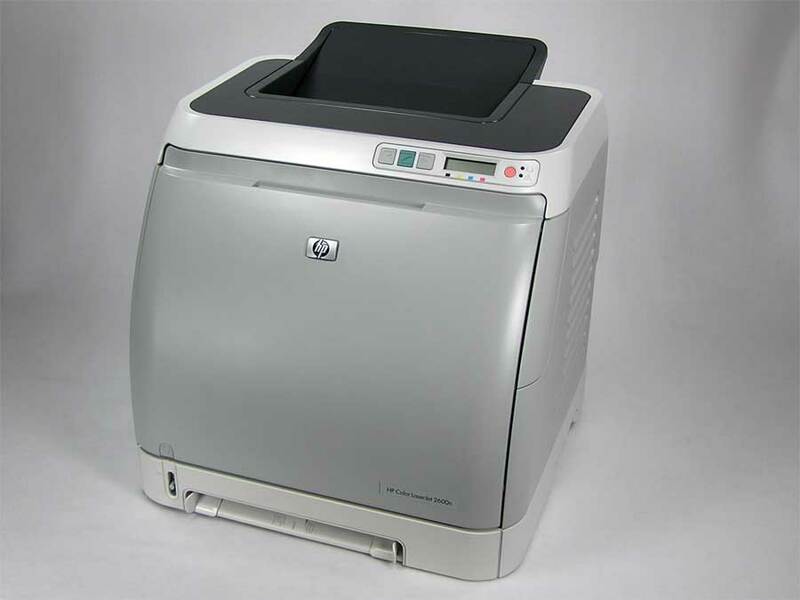 This impressive 6-color printer brings quality and convenience home – at a truly remarkable value. Compatible with both Windows® and Macintosh® systems, it quickly delivers brilliant scrapbook pages, homework assignments, and more. In fact, it’s the ideal solution – whatever the task at hand. Its resolution of up to 5760 x 1440 optimized dpi and ultra fine 3-picoliter ink droplets ensure photo quality color and detail, while its innovative Micro Piezo® ink jet technology offers added precision. 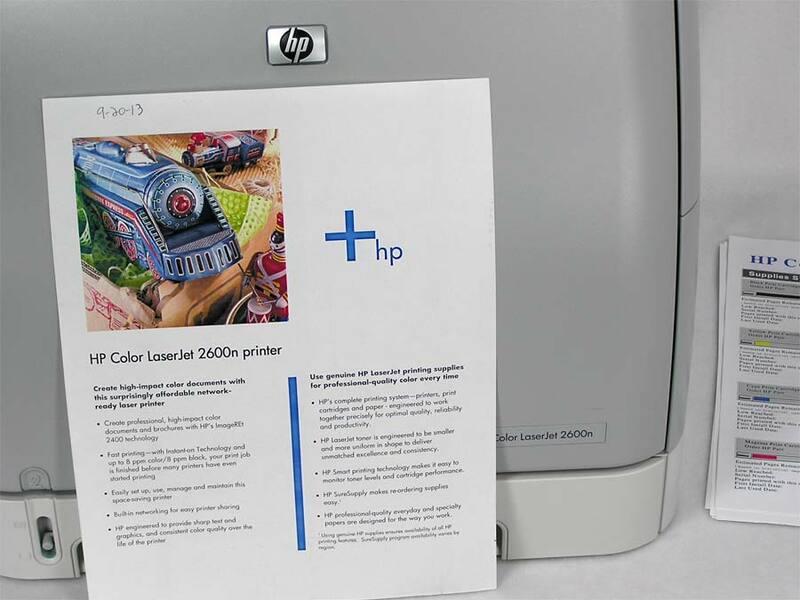 With cost-saving individual ink cartridges, it’s an easy, economical home printing solution. Epson Software™ Film Factory™, included with the Epson Stylus Photo R200, enables anyone to create eye-catching projects using all their favorite photos. 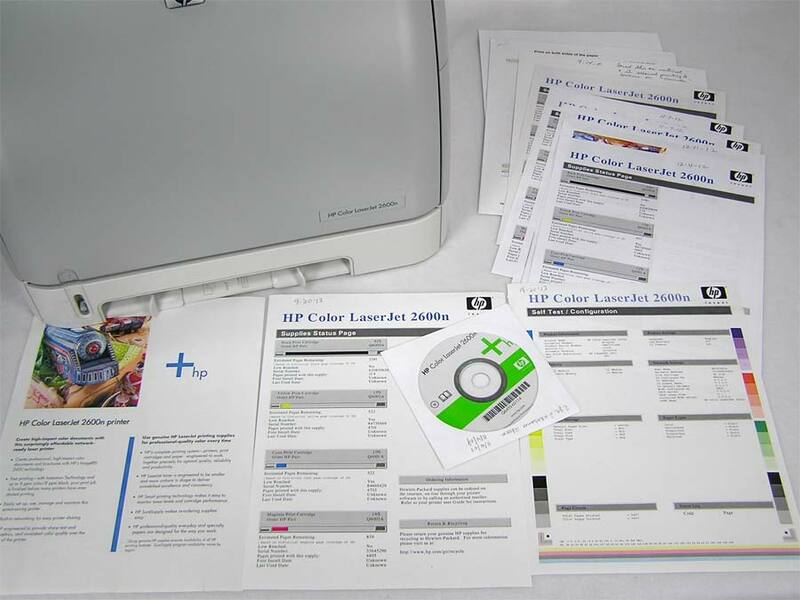 It even prints customized designs directly on ink jet printable CDs and DVDs. 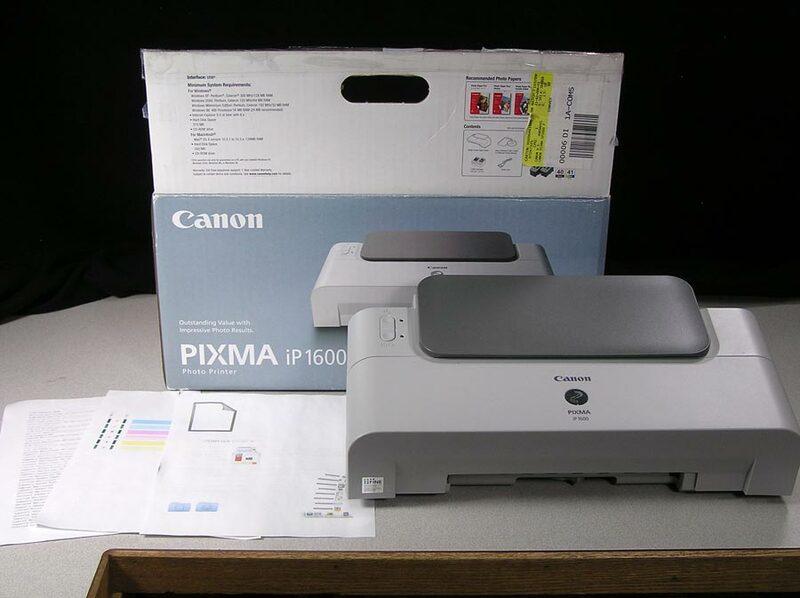 And because this printer supports PRINT Image Matching (P.I.M.) and Exif Print technology, this full-featured performer makes it easy to get great prints from P.I.M. or Exif-enabled devices. Specs and info are here. Drivers for Mac OS 8 – 10.11 and Windows 98 to 10 are here. 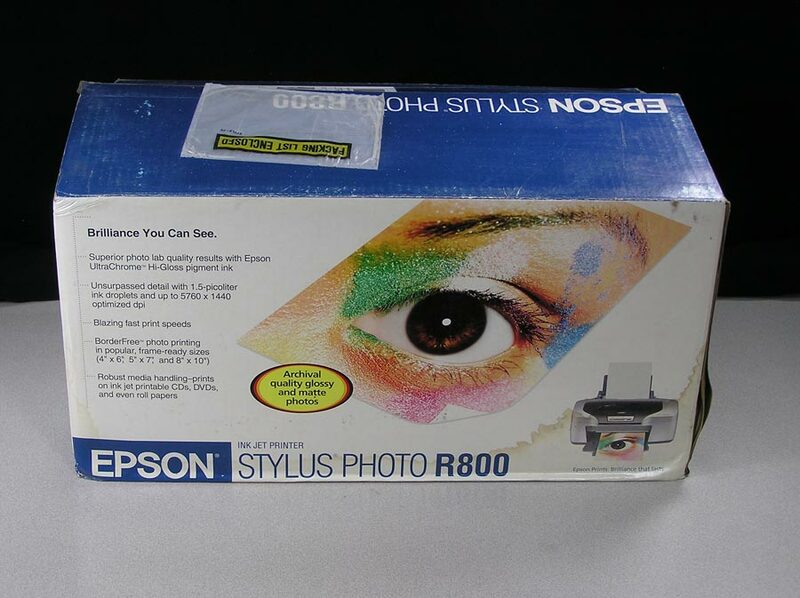 Epson Stylus Photo R800 Inkjet Printer. 5760 x 1440 dpi, 8 channel print head for enhanced 6 color photo printing, media handling prints on CDs, DVDs, and roll papers. You can make Banners! The box has been opened, but the complete contents have never been unwrapped or used. Contents are pictured above! Ah I just found a contents section on the box and it looks like the new USB and firewire cables have been added. Bonus! Windows 98SE 500MHz Pentium III or better, 128/256MB RAM. Please do your own research. Please note that the box has a little bit of water damage on the bottom. 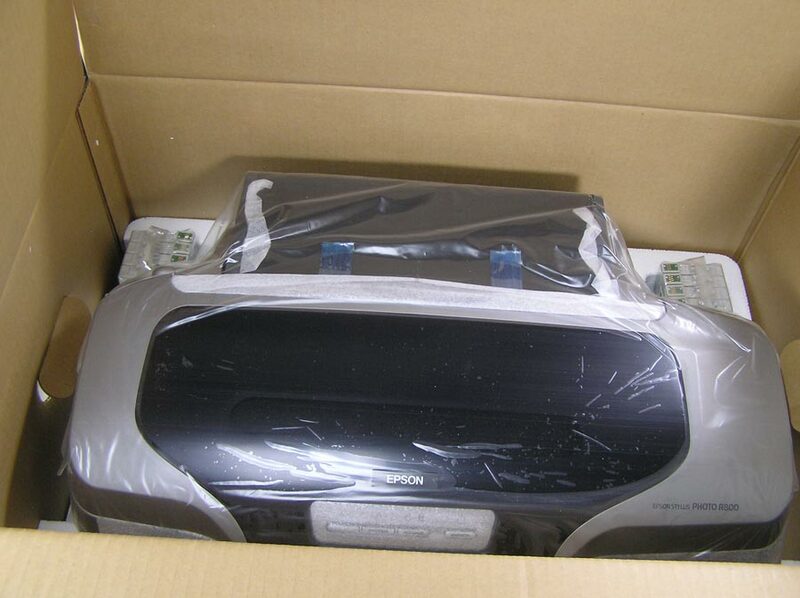 There is styrofoam in the bottom of the box, so shipping integrity may be okay. I am adding an option below to have it put inside another box for shipping if that is your preference. 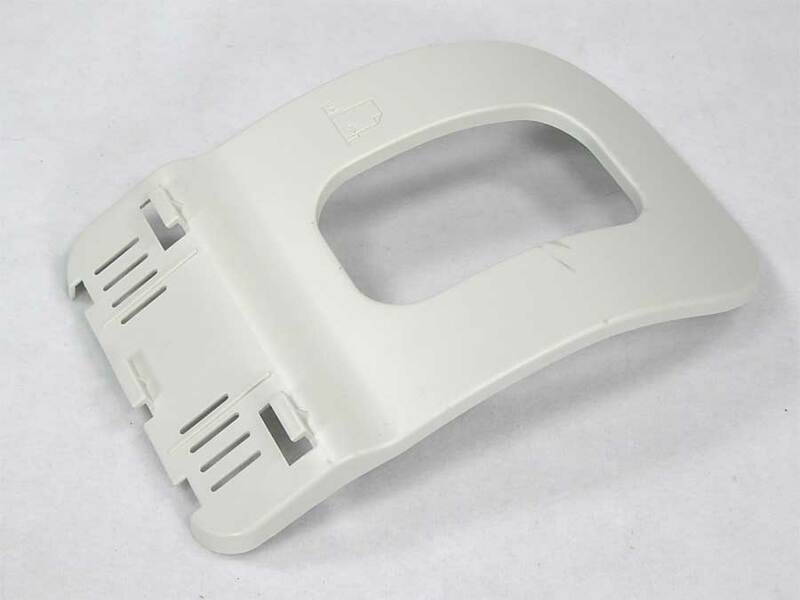 It will add a little weight and dimensional weight. No warranty as to usability just that it is new and untested! First page out speed is 20 seconds! Information from setup to drivers are available from HP. Mac OS 10.2.8 to 10.7 and Windows 98 to Windows 8. Latest test printed with Mac OS 10.4. Product overview is here, with links to drivers and other info. 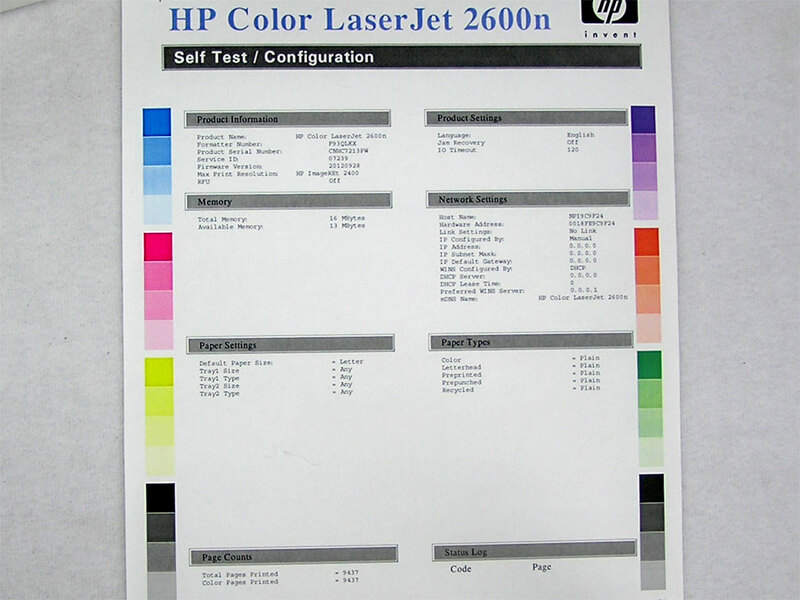 What’s included: Hp Color LaserJet 2600n printer, CD, current and historical supplies status and self test pages along with instructions for double sided printing and cartridge override. Printer looks and works great! Current stats: 9,437 pages printed. 2,281 pages remaining black, 522 pages remaining yellow and cyan, 839 pages remaining magenta. 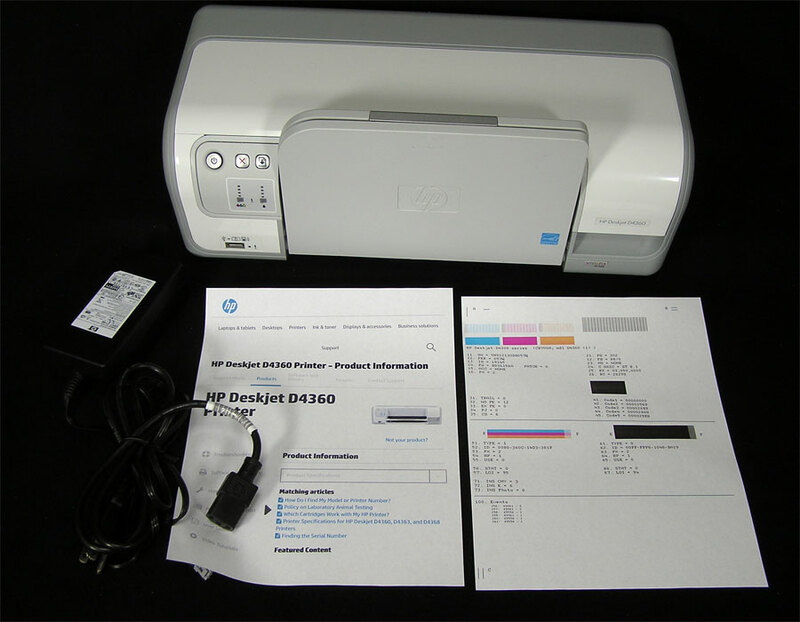 The HP Deskjet D4360 is an all-around printer for home use. 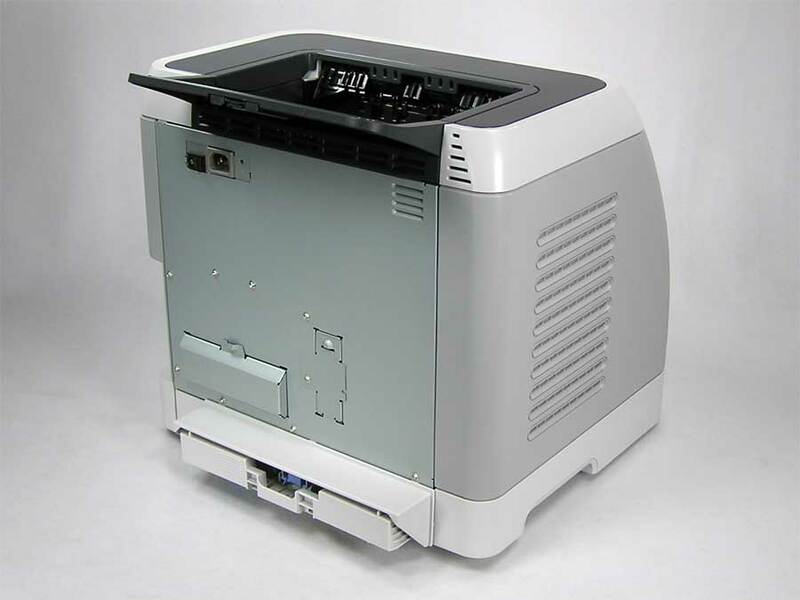 This color printer is ideal for home offices and students. 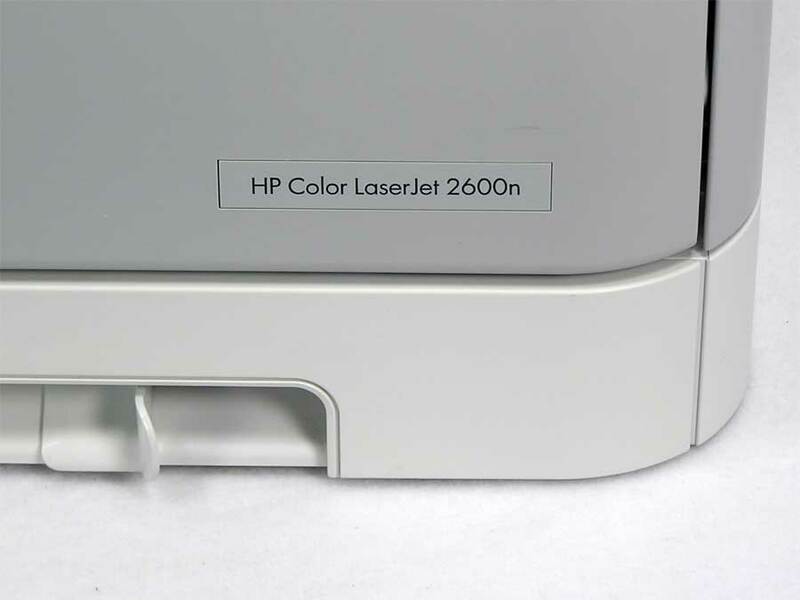 Sturdy, reliable and easy to use, this HP inkjet printer produces up to 30 pages per minute in black and white and 23 color pages per minute. It has a maximum resolution of 4800 x 1200 dpi, enabling it to deliver quality, borderless 4 x 6-inch and panoramic photos in addition to plain documents. 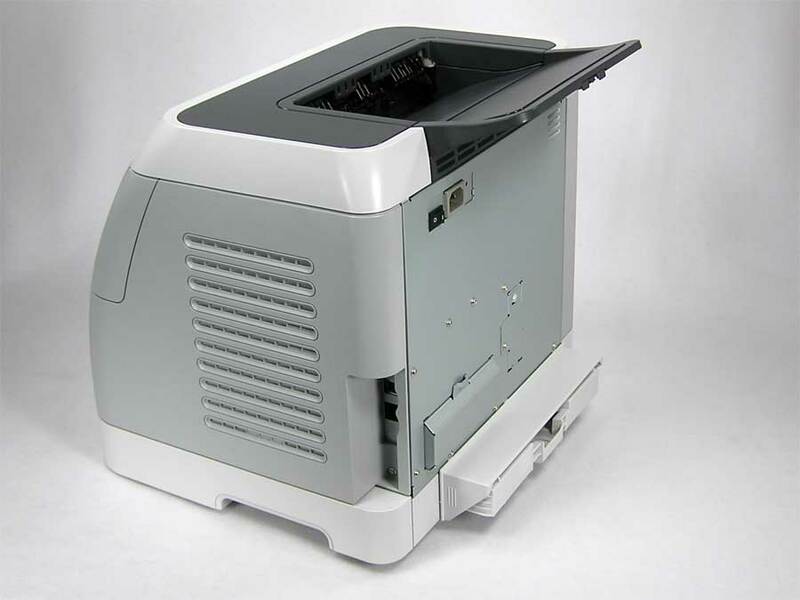 This color printer is compatible with both Mac and PC platforms, so offices using different operating systems don’t need other printers. 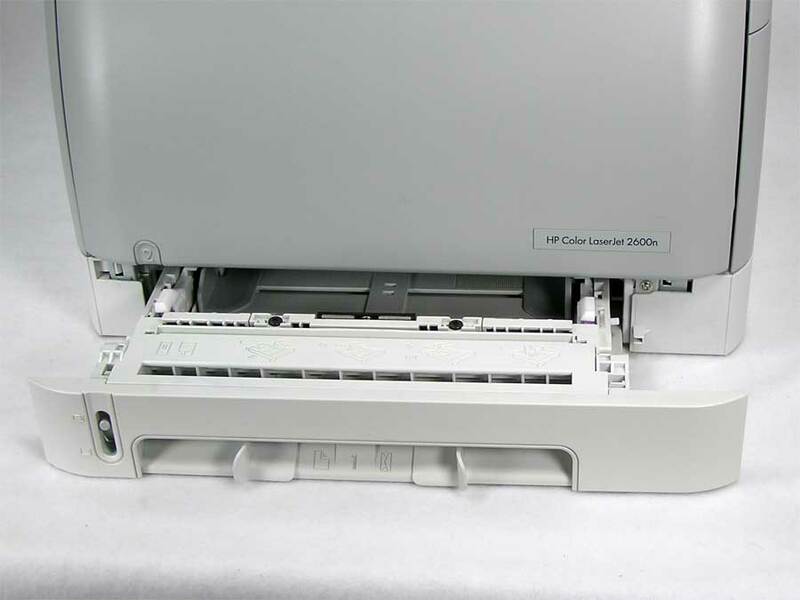 The HP inkjet printer has 2 USB ports conveniently located on the front and back of the machine. More info available at HP. Included are the power adapter and both ink cartridges are new! Only 302 pages printed if I am reading the report right! Drivers available for Mac OS 10.3 to OS 10.11 and Windows 2000 to 10. 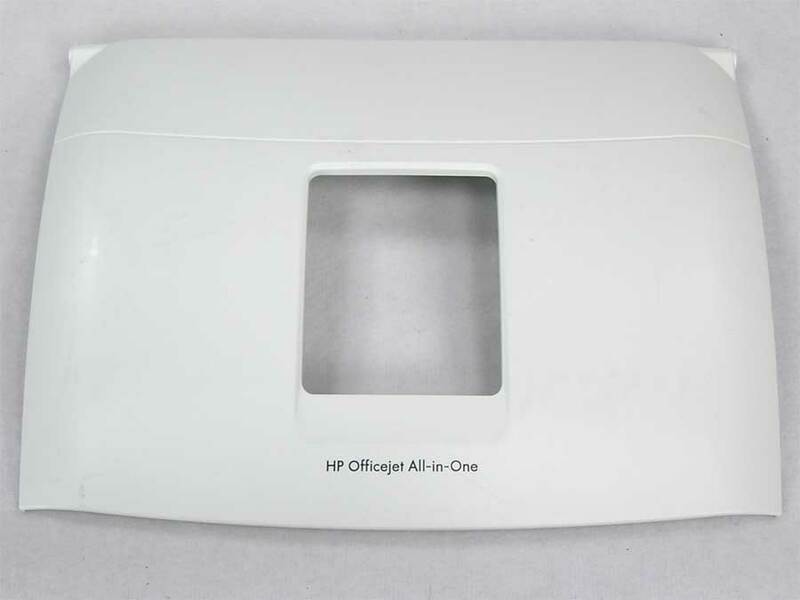 Fold up top / rear paper support /input tray for HP OfficeJet All-In One 4215. 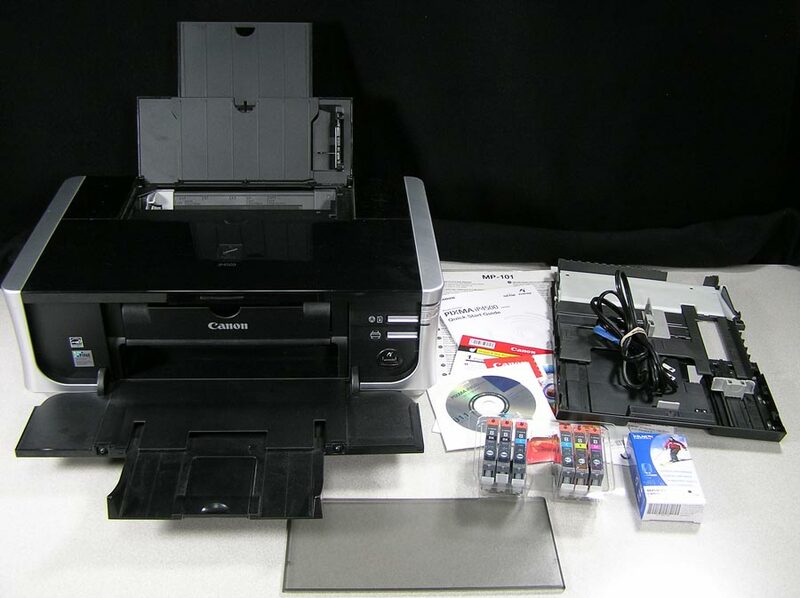 All-in-one printer, scanner, and copier for home office and photo printing. 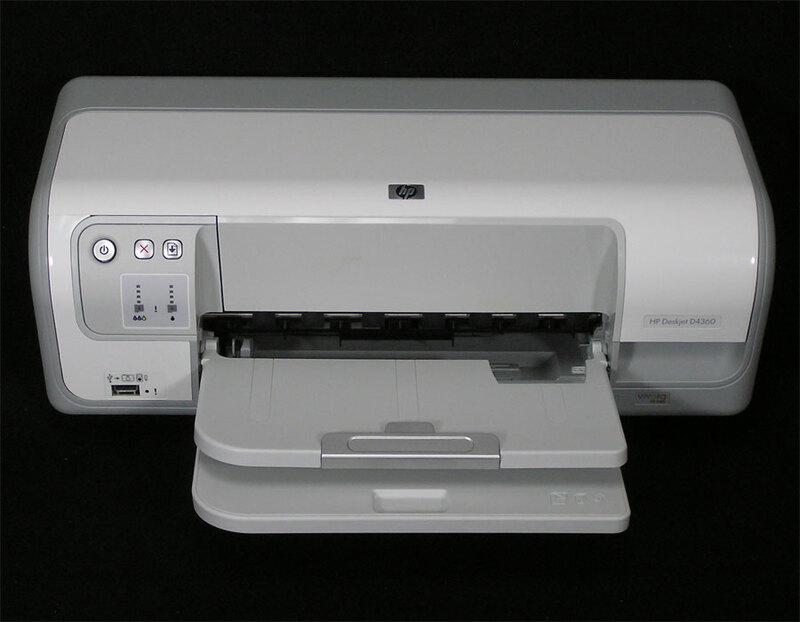 This Photosmart C4280 is fairly small for an all-in-one printer at 18 x 12 x 7″. Preview and print photos without a computer by using 1.5-inch display and by using the camera memory card. 4 memory card slots – CompactFlash, Memory Sticks (Duo), SD, MMC, and xD-Picture Cards. 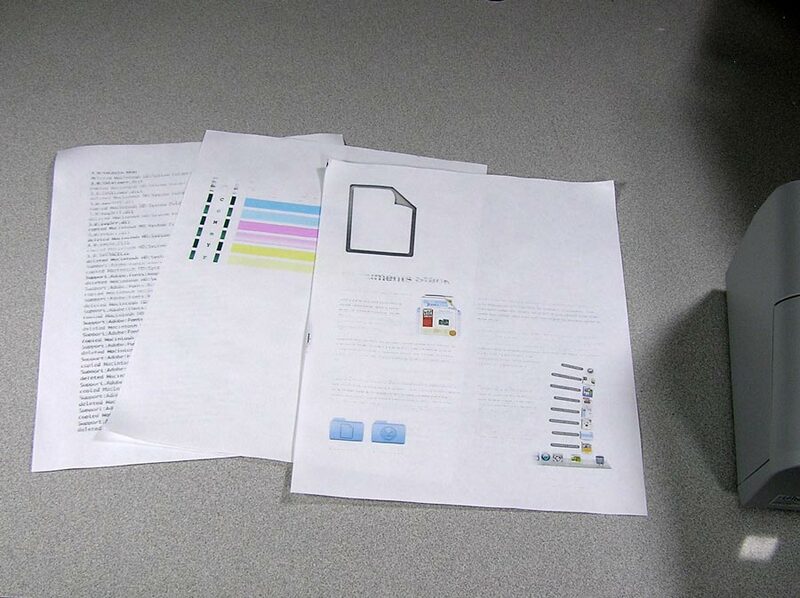 Print and copy snapshots with or without border. 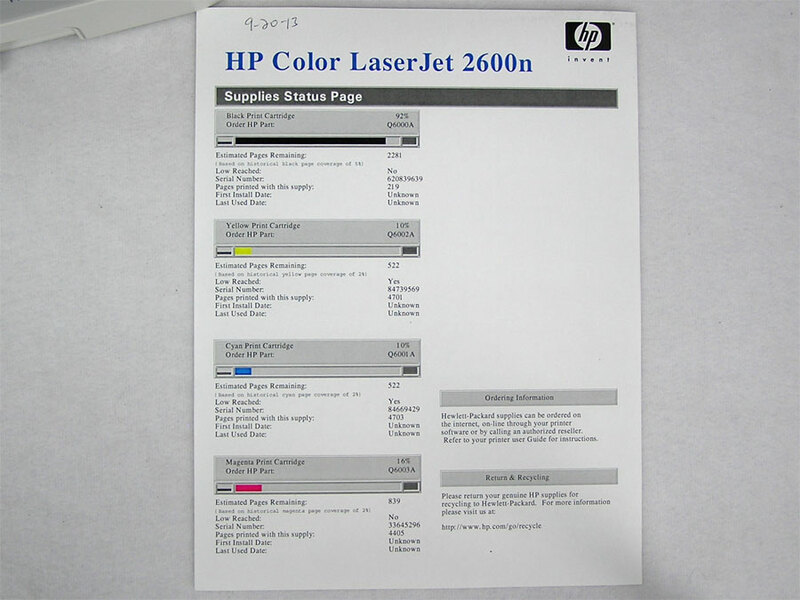 Print photos and laser-quality text with speeds up to 30 pages per minute in black and 23 in color. 4800 x 1200 dpi. This printer looks good and prints. Cartridges on their last leg were borrowed for testing, so it needs ink! 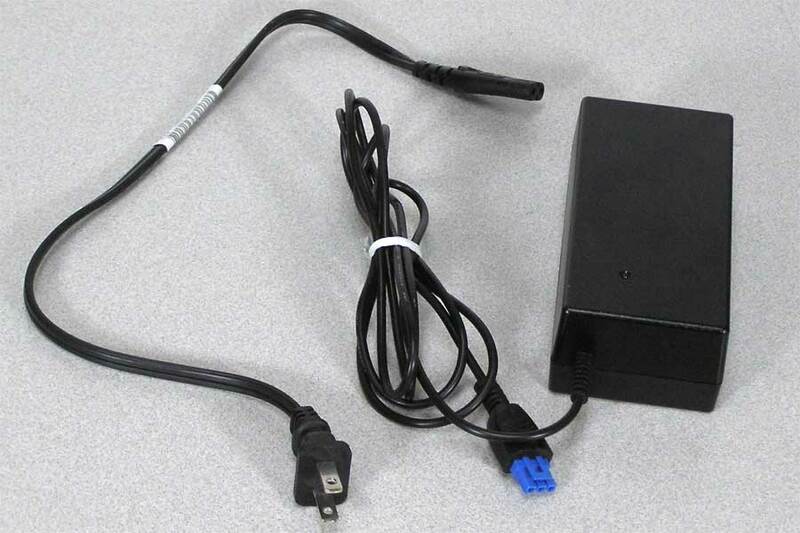 Comes with a Basics Guide, power cable and USB cable. Drivers and product information can be found at HP here. Sold as-is. Input: 100-240V, 50-60Hz, 1800mA. 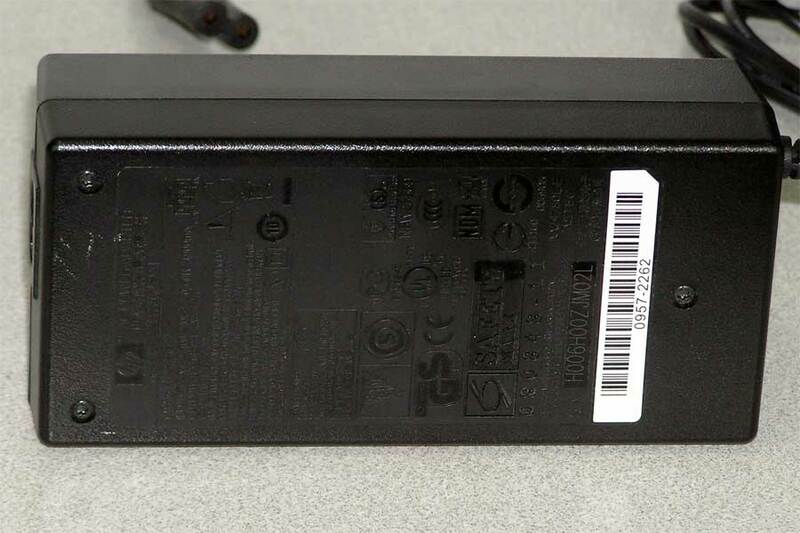 Output: +32V, 2000mA.